Protection from tornadoes and intruders. Can withstand over 100,000 lbs of crush weight. Impact tested at the ATSA testing facility. Seamlessly welded for maximum durability and protection. Professional installation - usually in just a few hours. 4x6 ft holds 6-9 people. 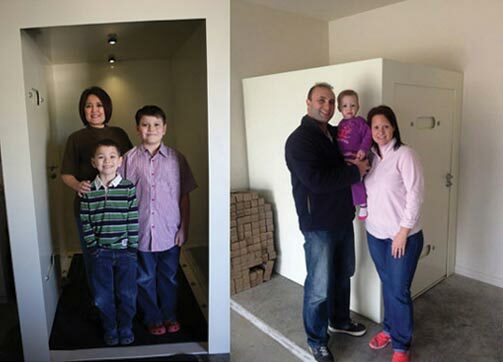 4x8 ft holds 8-12 people. Five locks, including a bolt lock for safety. Unlockable from outside by removing air vents. Custom Sizes as small at 30" X 48" or as large as 8'x8'. 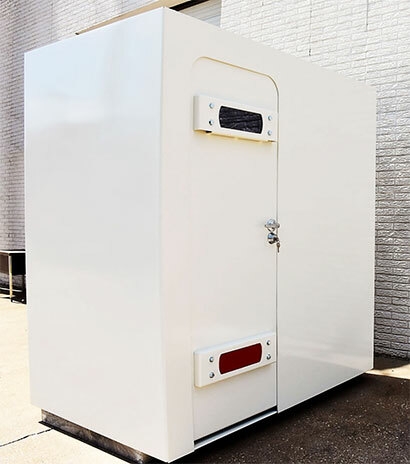 Our safe rooms can be built in to new construction or moved into existing construction. I am qualified for a FEMA storm shelter rebate. Can you install it?